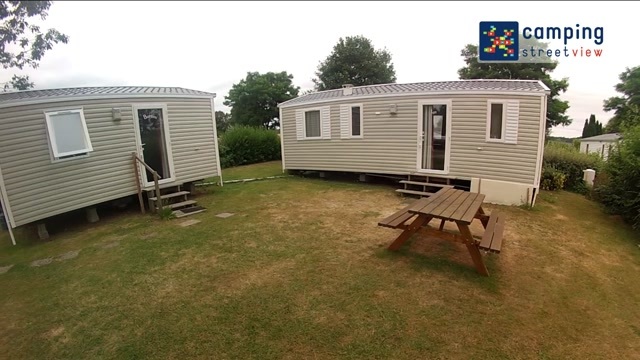 These mobile homes without sanitary facilities (and without running water) are equipped as follows: - Fully equipped kitchen with tableware, fridge, coffee machine, 4 burner gas hob, microwave, hood - 2 separate bedrooms with electric heaters and 2 single beds of 70x190 - Wooden terrace, garden furniture - Television - Free access to Wi-Fi. - Equipped kitchen with tableware, fridge, coffee machine, 4 burner gas hob, hood, microwave - 1 Separate bedroom with 1 bed of 140x190 OR 2 beds of 80 x 190 - Electric heaters* - 1 bathroom with shower, washbasin and toilet - Garden furniture - Television - Free access to Wi-Fi. - Lounge - Equipped kitchen with tableware, fridge, coffee machine, 4 burner gas hob, hood, microwave - 1 bedroom with 1 double bed of 140x190 - 1 bedroom with 2 single beds of 80 x 190 - Bathroom with shower, washbasin - Separate toilet - Electric heaters* - Garden furniture with parasol - Terrace or small garden - Television - Free access to Wi-Fi. Mobil Home Premium 33m2 - - 1 seating area - 1 fully equipped kitchen area with crockery, fridge, coffee maker, kettle, toaster, gas hob 4 burners, hood, dishwasher and microwave - 1 bedroom with a double bed 160x190 and its private bathroom and separate toilet - 1 bedroom with 2 single beds 80 x 190 and its private bathroom and separate toilet Hotel formula: Beds made on arrival Towels provided - electric convectors in each room - 1 garden furniture - Terrace or private garden - TV included, flat screen and TNT - Free wifi access. Premium COTTAGE 40 m2 - - 1 seating area - 1 fully equipped kitchen area with crockery, fridge, coffee maker, kettle, toaster, gas hob 4 burners, hood, dishwasher and microwave - 1 bedroom with a double bed 160x190 and its private bathroom and separate toilet - 1 bedroom with 2 single beds 80 x 190 - 1 bedroom with 2 single beds 80x 190 mezzanine Hotel formula: Beds made on arrival Towels provided - electric convectors in each room - 1 garden furniture - Terrace or private garden - TV included, flat screen and TNT - Free wifi access. - 1 coin salon - 1 coin cuisine tout équipé avec vaisselle, frigo, cafetière électrique, table de cuisson au gaz 4 feux, hotte, micro-ondes - 1 chambre avec 1 lit double de 140x190 - 1 chambre avec 2 lits simples 80 x 190 - Salle d'eau avec douche, lavabo - W.C séparé - Convecteurs électriques* - 1 salon de jardin avec un parasol - Terrasse ou jardin privatif - Télévision incluse - Accès wifi gratuit. No drain for waste water so had to lift a heavy container to empty it. Fresh water tap was not labelled. Friendly reception and helpful staff. Toilets and showers kept clean. Did not use the pool but it looked nice. 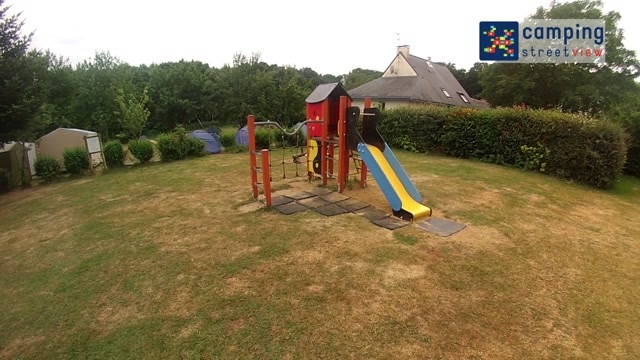 Piscine un peu petite dès qu'il y a du monde mais hors saison, ça le fait. Belle terrasse agréable même au mois de novembre dès qu'il y a un rayon de soleil ! Proximité de certains espaces tente avec les bungalows; les personnes logeant dans un bungalow ne se rendant pas compte du bruit généré pour des campeur en tente juste à coté d'eux. 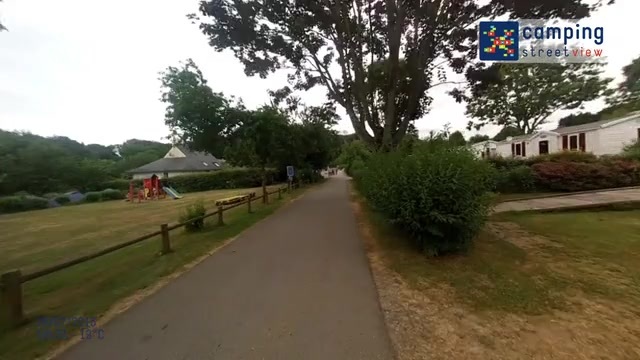 Grand espace dans lequel on peut mettre plusieurs tente et tout de même garer la voiture.